The nostril is a little big but otherwise I think it's really good. I created this in about 45 minutes. Super cute! Whoever posted those comments needs to stop putting people down. Sydney made an AMAZING, FUN, website. Girls, lets keep it that way! God would like it, too. Thanks, Sydney, for a cool website without ads. YOU'RE WEB'S (and you) THE BEST! I love cute stuff and this drawing is adorably cute, I wish I was an artist and then I would put a few of my horsy pics on here. But anyway, great job! I like the way it's forelock curls a little bit and you did great on the head shape not to mention the lines and muscles, well... the whole thing is great. Lol. Love it! I like horses and I just really like it! It's really good, I like the muscle lines and the cute nose!!!! Super good! so cool great details super pony! i feel like i can never stop commenting! i am sorry that some people said mean things about you i think it's good. I think that it is very good after all I am only 8 so for me well that is awesome! you could maybe practice a little more and then you can be really good even better. I draw horses too I sell them sometimes or I just give them away. I practiced a lot and so far I can draw really good and you do so with even more practice you be so good. I used to draw my horses like that and paint it like a rainbow. i love it except the ears seem a little small. Pretty good. Maybe make the ears bigger nostrils smaller, and maybe spend a little less time on it, but overall a pretty good piece of art. Hi, it's horse artist and I totally agree what you said. Omg I love your pic! I can't draw as good as you. I'm only 11. Again great pic! Nice drawing, i luv it! It's really good! And i agree the ears could be a little bigger, but it's still awesome! wow that piece is EPIC!!!!!!!!!!! better than i can do.. I love your drawing! people who say they have done better there just jealous of it. I think it looks very well. don't listen to people like that just keep up the good work! Verry good. The ears could be a bit bigger. Thank you to everyone who has put such nice comments on the drawing. Oh ya, and to whoever wrote that mean message that said, "It's good, but I've done better", how could you say that? How would you feel if you drew something that you thought was good and then someone said that they could do better? Ya, I know that someone could do better but it didn't need to be told to me that way. Only someone that is mean, selfish, and one of the the-world-revolves-around-me people. So thank you for hurting my feelings. it's awesome by KAILYNN EIGHT YEARS OLD. that is a great picture! FABULOUS job!! I like it, I don't see how anybody wouldn't like it. Don't beat yourself up about. this is a great piece of work. How do u do it?? I like it, keep up the good work! I think your draft horse is very cute and beautiful. 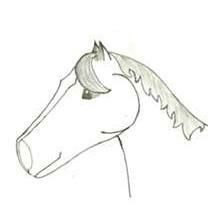 I submit my drawings into Bella Sara- the horse cards. Again, I think your drawing is lovely and whoever sends mean messages are just jealous, they can't draw like that. Draw some more!! It's pretty good, but I've done better. Keep practicing, and I'm sure you'll get better! I love your drawing! Keep up the good work! I love it, I wish I could draw as good as you!!! How did you learn to draw like that? omg i think your drawing is cool, love it! It needs some work, but it's a great cartoon horse!